By the time spring break rolls around, you are more than ready to take a much-needed – and much-deserved – vacation. One of the best ways to bring your family together during this time is to plan a trip full of adventure, relaxation and luxury with a little something for everyone. Reserve a deep sea fishing charter with The Triple-Trouble today to get your family out on the water, fishing rod in hand, enjoying the rolling blue waters and the victories of catching trophy fish. Here are three reasons to plan your next spring break vacation with The Triple-Trouble. Gone are the days of sitting around a technology-free family dinner table taking turns talking about your day. Today, dinner means kids and parents alike staring at a tiny, glowing screen and half-listening to your family members as they try to share something important with you. Grab your family and spend some real quality time together aboard The Triple-Trouble. Spring break means time off for the whole family, and a convenient time to take the family on a meaningful trip filled with opportunities for bonding. Don’t worry about finding time in everyone’s schedule for a family trip – spring break was made for the large family just trying to vacation together and bond. Imagine a relaxing afternoon on the crystal waters as you take in the sights and try your hand at fishing. Relax in the air-conditioned salon, equipped with a flat-screen TV and radio, or enjoy downtime in one of two staterooms. A trip full of luxury and relaxation awaits your family. Throughout the year, your children and teens sit in school while you sit behind a desk in a stuffy, dull office. Get out in the surf and sun with a deep sea fishing trip. The Triple-Trouble is a fully equipped, 46-foot Hatteras fishing yacht with features built for both expert fishing and maximum comfort. Sit on the deck with your fishing rod to enjoy the sun and waves as the fish come in, and have lunch out on the water as you take in the scenic backdrop of the beautiful coastline. A deep sea fishing charter off the coast of Orange Beach, Alabama, provides gorgeous scenery to admire, as well as the potential for record-breaking catches that are sure to help you make memories to last forever. Our experienced fishing captain helps new and experienced fisherman alike, including kids of all ages, learn how to safely and effectively deep sea fish. The lack of fishing pressure during the winter months often causes fishing in the spring to be better and more plentiful. Your family will love all of the opportunities to catch the variety of fish in the Gulf waters off the coast of Alabama aboard the luxurious Triple-Trouble. The different types of fish you can catch depends a lot on the vessel you travel on and the time of year that you visit. Deep sea fishing always provides an off-shore fishing adventure, which means grouper, mahi mahi, snapper, swordfish and sailfish to name a few. 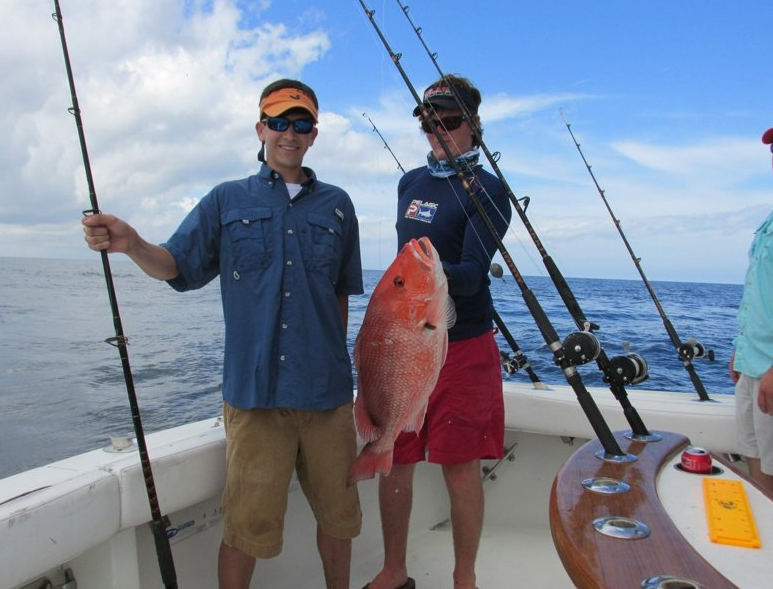 Offshore charter fishing is perfect for new and experienced anglers alike. Bring your fish aboard for some photo opportunities, or have your catch mounted and show it off for your friends and family. Book your trip today for adventure, relaxation and lifelong family memories. To learn more or to make reservations for your deep sea fishing trip, call Capt. Chad today at 256-431-5767.